This was one of the movies that I watched during my 7 hours flight home from holiday. It was available through the Garuda inflight entertainment (which had sooo many options by the way) and classified under New Release & Comedy. Something that I was looking for after watching a very heavy drama earlier (I would post my views on that movie later). So let us get on with it. Park Ki-joon (Park Seo-joon - Chronicles of Evil, Fight For My Way TV series etc) was the son of a single mother who wanted to apply to the Korean Police University in order to be getting free education. Ki-joon was an easy going, kind-hearted and passionate person who was always act first and think later. During the first few weeks of orientation before proceeding to the education, Ki-joon met and became best friends with Kang Hee-yeol (Kang Ha-neul - Twenty, Moon Lovers: Scarlet Heart Ryeo etc) who was the total opposite of Ki-joon. He was a thinker and overly concerned of hygiene. In the third year of their university education, Ki-joon and Hee-yeol were feeling a bit bored with their lives and wanted to take a leave day to get different experience. After gotten their leave approved by Professor Yang (Sun Dong-il - Miss Granny, The Accidental Detective etc), they went on to go to night club to have a good time and look for pretty girlfriend. As we could have guessed, the efforts were totally unsuccessful. And when they wanted to leave, they witnessed a young lady kidnapped. They tried to rescue her but could not do so, and hence they decided to inform the nearest police station. However, the police was busy with another case and it was not possible to allocate any police immediately. Ki-joon who was the more passionate one, urged Hee-yeol to do the rescuing by themselves. And off they start on a dangerous "mission" to run across the city to find the girl that whole night. So could they successfully rescue her before the critical time was over? Find them all in this hilarious, wonderful comedy action movie. This was a very good comedy action movie that I enjoyed a lot. It was full of comical funny moments from early part till the end. Even during the full action part (towards the final fight), there was still a hilarious moment that made us laughed. Yes, my wife also saw this one and she had a lot of laughs as well. Back to the movie itself, the story started with something simple enough, just 2 young men became best friends and their struggle to become police officers. But after the kidnapping scene started, it became a bit more complicated. Apparently by investigating it, they stumbled into something a lot bigger than they thought would be. 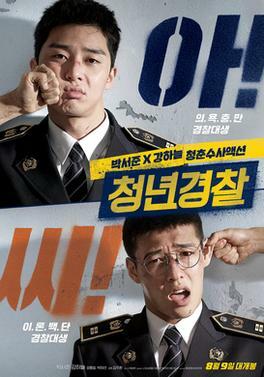 What made us enjoyed the movie was not only it had so many funny scenes, but the mystery and also the bromance between the main cast Park Seo-joon and Kang Ha-neul that was so believable as truly best buddies. And of course the additional supporting cast also gave more color to the movie, especially Park Ha-seon (Champ, High Kick: Revenge of the Short Legged TV series etc) playing as a tough lady cop nicknamed Medusa and another funny police recruit who was always bragging about his father (unfortunately I could not remember the name of his character and his real name). Aside from those funny scenes and also some action that may not be top notch but entertaining nevertheless, the movie also had some touching moments. Especially during the mid end-credit scene which still combined with some funny moment. For a movie that had duration of 109 minutes, I think it was just nice. Not too long and not too short. I also understand that the movie was pretty successful in Korea where it made the top 10 list of Korean box office in 2017. My only regret to this movie was that I did not see it when they played in Indonesian cinema back in August 2017, but at least I still got the chance to see it few days ago. And I got to say that it really brighten up my flight. Overall, this movie would be worthwhile to see if you want to experience some laughs, some bromance and few actions. I believed the movie would appeal to ladies and those Korean movies fans due to the two main cast. I also just found out that the movie was a debut for Park Seo-joon as lead role in a movie. And please do not expect a very heavy drama with multiple plots that would blow your brains out. This is simply not that kind of movie. It is a light hearted movie aimed to make you feel good and happy after watching it, which I believed they truly did it (at least for me and my wife who truly enjoyed and entertained by it). So if the movie is going to play in cable TV or if it's available via online streaming, I would recommend you to watch this one.